Congresspeople attend an event at the IOP's Bipartisan Program for Newly Elected Members of Congress, held in December of 2018. Eight Democrats and nine Republicans were coming to Harvard, and Marc J. Ambinder ’01, a college senior and budding political journalist, wanted to meet them. The year was 2000, and the Institute of Politics was hosting its bipartisan orientation for the newly elected members of the House of Representatives, as it had for nearly three decades. Over the course of four days, Harvard scholars, government representatives, and other leaders would engage with the freshmen lawmakers, offering diverse perspectives on contemporary issues and congressional duties before the new members returned to Washington for their swearing-in. Ambinder decided to cover the traditionally press-free event for The Crimson, which the IOP allowed so long as he received permission from the individuals he wished to quote. One was Ric Keller (R-Fla.). “I just sort of glommed onto [him],” Ambinder recalls. Ambinder noticed that in one session, while the other members-elect — who included future House Majority Leader Eric I. Cantor (R-Va.) and future Senator Jeff L. Flake (R-Ariz.) — were engaging with the panelists, Keller was scribbling away at a draft of a bill to expand Pell Grants. Keller explained to Ambinder that he planned to drop it in the hopper the first day Congress met in session. Simultaneously, panelist Ralph Hellmann, then-legislative director for the Speaker of the House, was advising the new legislators against making bold moves. 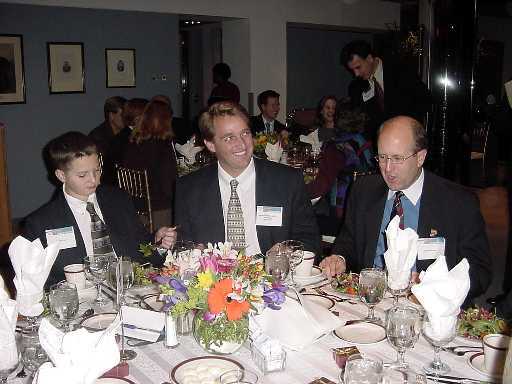 Jeff L. Flake (D-Ariz.), center, and his son, left, attended the Institute of Politics’ Bipartisan Program for Newly Elected Members of Congress in 2000. Last December, when 55 Democrats and nine Republicans descended on the Kennedy School campus for another Bipartisan Program for Newly Elected Members of Congress, a parallel scene unfolded. Rashida H. Tlaib (D-Mich.) was listening to Gary D. Cohn, former chief economic advisor to President Donald J. Trump and former Goldman Sachs President, address the freshmen. “You guys are way over your head, you don’t know how the game is played,” he allegedly said. The Washington Post reported that another attendee “interpreted Cohn’s remark as meant in jest, rather than an insult of the new lawmakers,” who were purportedly discussing the possibility of a bipartisan infrastructure package. Members of the progressive left, ushered into Congress when Democrats flipped the House in 2018, protested the absence of union representatives and grassroots organizers in the panels at the orientation while criticizing the presence of corporate leaders like Cohn. They noted that former government officials’ lobbying ties were not prominently disclosed, raising a social media storm that launched the orientation into national headlines. The orientation program has historically placed the IOP at a unique intersection between two focal points of power: Harvard and Washington. But today’s hyper-partisanship has called upon the IOP to reassess its position in the face of an “obliteration of norms,” as Ambinder, now editor-at-large of the news magazine The Week, says. Nearly 50 years ago, Harvard claimed the distinct responsibility of educating new lawmakers, along with the advantages of forging such connections. The orientation’s bipartisan mission, though, predated the polarization of today. While historically, the IOP has faced difficulty attracting Republicans to the program, this year, Democrats also found fault with it. Vulnerable to criticism from both sides, the IOP nonetheless adheres to its original vision for the orientation. But it is also open to adapting its curriculum in response to last year’s controversy. School was in session for four congresspeople at Harvard in 1972. Freshman orientation programs for congresspeople had already begun to crop up in the 1960s. In 1963, the American Political Science Association organized a program to prime new members on Congressional legislative processes, later partnering with the Congressional Research Services. The CRS also partnered with the Brookings Institution to offer a policy-focused conference for new members. The Republican Party organized a training conference for its new members after gaining 47 seats in 1967, and the Democrats followed suit in 1970 with a program of their own. At Harvard, the IOP wondered whether its resources might make it a prime candidate to enter the ring. Though founded only six years prior with a largely undergraduate-focused mission, in 1972, the IOP decided to take on a new type of student, bringing two freshman Democrats and two freshman Republicans to Harvard’s campus for a month-long training period. The program had a three-pronged goal: to help new members set up Congressional offices, to understand the legislative process, and to dive into contemporary policy issues. It was a period of trial-and-error. In early 1972, Ernest R. May, then the IOP director, scouted out two promising Congressional candidates based on recommendations from advisory committees. They were Barbara C. Jordan (D-Texas) and Yvonne Brathwaite Burke (D-Calif.). Jordan was the first African American woman from the South elected to the House, and Brathwaite the first African American woman to represent the West Coast. The IOP signed on Alan W. Steelman (R-Texas) and William S. Cohen (R-Maine) as additions to the pilot program. Steelman, 30, was the youngest member of Congress at his election, and Cohen was barely his senior at 32. Cohen was a moderate Republican — later in his career, he was one of the first Congresspeople to break from his party and vote for President Richard M. Nixon’s impeachment. From the start, the participants in the bipartisan program leaned slightly left. Talisman, formerly the assistant to Representative Charles Vanik (D-Ohio) and an IOP Fellow, developed the curriculum and served as the new members’ “tutor” over the course of their month-long stay at the Kennedy School. During that time, the four freshmen engaged with “a variety of experts,” Talisman wrote. About two-fifths had experience on the Hill, including former Speaker John W. McCormack, and three-fifths were academics, most of them from Harvard. Barney Frank ’61 (D-Mass. ), former congressperson and assistant to the director of the IOP from ’66-’67, recalls that Richard M. Neustadt, the IOP’s first director, wanted to draw attention to Congress’s role at a time when most attention was focused on the executive. “People were concerned that the executive had too much of the initiative in public policy,” Frank says, and Neustadt sought to refocus attention on Congress, which didn’t have “the kind of angry, very divisive partisanship we have now,” he adds. The IOP hoped to introduce members to Harvard’s resources, giving them contacts to consult on policy issues during their time in Congress. In that way, the orientation could strengthen the relationship between the university and Washington through what the IOP viewed as Harvard’s unique asset — its faculty. Faculty members and government representatives were once again the main focus of the program when it returned for its second run in 1974. Seventeen members-elect were invited, and the eight Democrats and four Republicans who attended heard from people like prominent Economics Professor Otto Eckstein, who discussed major economic issues the next Congress would face over a luncheon at the Signet Society. At the Spee Club, two Harvard professors led a discussion of national health insurance. The selected invitees had the opportunity to learn from the nation’s most prominent minds in an intimate academic setting, away from the pressures of Capitol Hill. In its early days, the orientation’s atmosphere was “cozy,” as Talisman wrote, if not patrician. But the IOP also viewed this environment as creating a “problem of ‘exclusivity,’” and decided to abolish its by-invite-only policy in 1976. This boosted the program’s attendance by the dozens, and, over the next decade and a half, the orientation became an established part of the election cycle. 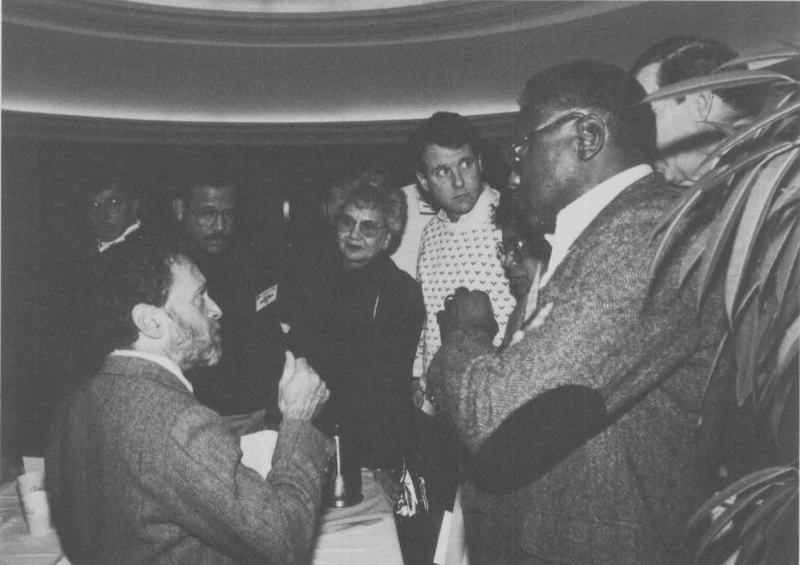 Robert B. Reich, former Secretary of Labor, speaks with newly-elected members of Congress at the 1992 orientation. Each new midterm brought the IOP a new crop of freshmen — the majority of them Democrats. On average, throughout the 1980s less than half of the new class of Republicans attended the program, whereas two-thirds of new Democrats did. Former IOP Director Philip R. Sharp explained that even though some Republicans thought of Harvard as “a high-prestige place to go,” others viewed it as “some left-wing place” — even as the House Administration Committee continued to put Harvard’s orientation on its calendar for congresspeople, few Republicans came. Among those who did attend, the program was well-received. The IOP continued to improve the orientation in accordance with new members’ feedback, shortening the orientation length, tailoring topics to contemporary policy issues, and giving the participants more of what they raved about each year — time to interact with each other and with students. Members praised the program in feedback forms: “Very worthwhile helping new members get to know each other, begin to understand ‘this system,’ focus on topical issues,” one respondent wrote in 1988. By 1990, the IOP had settled into a regular routine running its congressional orientation, but the new decade brought new challenges. In 1992, conservative think-tank The Heritage Foundation organized a competing orientation in Annapolis, MD held on the same dates as the IOP conference. Republican leadership urged its new members to attend the Heritage conference in lieu of Harvard’s, where they claimed the subject would be “‘family values,’ not the ‘tax and spend curriculum at Harvard,’” former IOP Director Charles T. Royer wrote in 1994. Meanwhile, the Democrats were told in regional meetings not to attend the Heritage Foundation’s conference, Royer writes. Only nine of the 52 new Republicans came to Harvard in 1992, including former Congressman Rick A. Lazio (R-N.Y.). He recalls the presentations themselves as largely left-leaning, confirming the evaluations of his Republican colleagues, but was not bothered. Liberal content was simply the “nature of the beast,” Lazio notes — the cost of having the opportunity to mingle with new Democrats. In one session, Lazio remembers sitting with other members in a circle, each speaking about his or her inspiration for having run for office. “That experience, in particular, I remember all these years later as very bonding,” he says. In 1994, however, there were no such opportunities for bipartisan connection. The “Republican Revolution” of 1994 ushered waves of conservatives into Congress, and Republicans reclaimed the House majority for the first time in 40 years. With Speaker Newt L. Gingrich (R-Ga.) at their helm, the 73 newly elected Republicans opted to forgo the trek to the “Kremlin on the Charles” — a phrase purportedly coined by Nixon, but still tossed around in the 90s, according to Sharp. The IOP, unable to hold a bipartisan orientation with only one party in attendance, cancelled the orientation entirely. Zoe Lofgren (D-Calif.) was one congressperson elected that year. She recalls that the boycott had “more to do with Newt Gingrich’s desire to keep Republican freshmen from fraternizing with Democratic freshmen” than the content of Harvard’s orientation. Representatives for Gingrich did not return requests for comment. When Sharp took over as IOP director in May 1995, he and Executive Director Cathy A. McLaughlin embarked on a massive campaign to rekindle relationships between Republicans and the IOP. The IOP reached out to the Heritage Foundation to “begin trying to build bridges,” Sharp says. It shortened its orientation program from one week to four days to lessen its burden on new members’ time. It diversified the speakers and topics to decrease the representation of Harvard professors, who were perceived as left-leaning. Before the 1996 conference, IOP representatives spent hours on the phone courting new Republican members. Ultimately, nine Republicans-elect agreed to attend, and the orientation was back on. In years since, the IOP has continued pushing for representation from both parties. This year, it collaborated with, but did not receive funding from, the American Enterprise Institute and the Congressional Institute, both formally nonpartisan nonprofits that traditionally lean conservative. It also collaborated with the Center for Strategic and International Studies, a bipartisan nonprofit known for its left-of-center foreign policy. The think tanks recommend and help provide speakers to the IOP. Framing events in neutral language is one tactic the IOP has used to appeal to Republicans, but interest still remains low. In 2018, nearly two-thirds of the Republican freshmen attended the Heritage Foundation orientation while about one-third attended the IOP orientation. “In hard-core red districts, [representatives] think they might be publicly criticized for going off to an elite, left-wing school,” Sharp speculates. With other orientation options available to new members and limited time, “it just remains a contest,” he says. IOP Fellow Carlos L. Curbelo (R-Fla.) chose not to attend the Harvard orientation in 2014, explaining that with a young family, he wanted to minimize time spent traveling. He opted to attend the Congressional Research Service’s orientation instead. Over two decades after the Republican boycott of 1994, the IOP has found itself in the midst of another dramatic political shift. But while the events of 1994 were precipitated by a national swing toward a new strand of conservatism, the sharp criticism of the 2018 orientation came from the opposite side of the aisle. 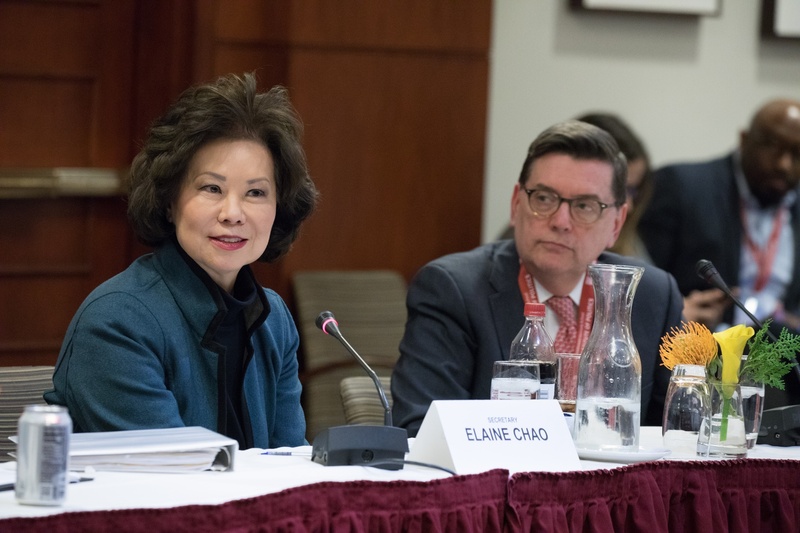 At 5 p.m. on Dec. 4, the first night of the orientation, current Secretary of Transportation Elaine L. Chao was set to address the new members. As Chao was delivering her speech that evening, Pressley was standing outside the Charles Hotel delivering her own. Joining her were fellow Democratic members-elect Alexandria Ocasio-Cortez (N.Y.), Andy Levin (Mich.), Lori Trahan (Mass. ), and Mary Gay Scanlon (Pa.). Though some media outlets portrayed the Democratic representatives-elect as the organizers of these protests, which the Center for Popular Democracy and other Progressive coalitions held throughout the three days of the program, they are more accurately described as collaborators and guest-stars. Representatives for Pressley and Ocasio-Cortez declined to comment, and representatives for Levin, Trahan, and Scanlon did not respond to requests for interviews. Secretary of Transportation Elaine L. Chao and IOP Director Mark D. Gearan ’78 address new members of Congress on the first day of the bipartisan orientation program. Still, the progressive congresspeople’s actions stood as a testament to their preference to being on the ground, among grassroots organizers, rather than in closed-off conference rooms. But in 2018, “corporations” and the “academy” were upstairs on the fifth floor of the Taubman building while activists were outside on the sidewalk, leading protests on climate change and Puerto Rican debt divestment. By 11:40 a.m. on the third day of the program, Ocasio-Cortez was frustrated: “Goldman Sachs is here,” she tweeted. “Where’s labor? Activists? Frontline community leaders?” The tweet blew up. The IOP had invited at least one activist to speak at the orientation. Brittany Packnett, Black Lives Matter activist and cofounder of Campaign Zero, a policy website for ending police violence, was slated to appear on the panel, “Navigating Washington and Capitol Hill,” but could not attend due to illness. Two activists, Bryan A. Stevenson and Malala Yousafzai appeared on IOP forums concurrent with the orientation, which members were invited to attend. However, no labor representatives were invited. The only time a labor representative appears to have participated at the orientation was in 1982, when the AFL-CIO sent Howard D. Samuel, president of the group’s Industrial Union Department, to speak on a panel about international trade. “The observation of no labor representative is, I think, a fair one,” current IOP Director Mark D. Gearan ’78 says. But the line between expert and activist might not be so clear. Jennifer Flynn Walker, who helped organize the protests as Director of Mobilization and Advocacy for the Center for Popular Democracy, states that activists are themselves experts. By noon on Dec. 5, the second day of the orientation, climate protesters swarmed outside the Kennedy School’s Taubman building. Ocasio-Cortez came downstairs to show her support. Simultaneously, Dean of the Kennedy School Douglas W. Elmendorf urged the activists to quiet down so as not to disturb the new members’ learning spaces, Walker says. In the 1980s, as the orientation was still expanding, the IOP enlisted corporations to help fund the program, but largely didn’t feature corporate speakers. Sears gave financial support in 1980, and by 1990, AT&T, AlliedSignal (an aerospace and automotive parts manufacturer), Bull HN Information Systems (a technology services company), and Sun Company (an outdoor-products retailer) provided funds as well. The IOP stopped accepting corporate funding for the event after 1990, and is now the sole sponsor of the orientation. In the past two decades, however, corporations have jumped from sponsors to speakers. Eight of the last 11 orientations since 1998 featured corporate CEOs; prior to that, they had little representation. The early CEOs were former government officials. Thomas F. “Mack” McLarty, III, former CEO of natural gas company Arkla and current chairman of McLarty Associates, spoke in 1998. Kenneth Duberstein, CEO of the Duberstein Group, a political consulting company that advocates on behalf of corporations and associations, spoke in 2000. Both were former White House Chiefs of Staff, McLarty under President Clinton and Duberstein under President Reagan. In 2014, the IOP hosted a panel exclusively comprised of CEOs, called simply “CEO Roundtable.” The first panelists were the CEOs of Xerox and American Express. The next Roundtable, in 2016, included the CEO of Mastercard. By inviting more CEOs, the IOP has sought to represent perspectives outside of its original academic and governmental focus. “To sit down with a few CEOs, for many of the members was useful,” Gearan, current IOP director, says. Sharp points out that the presence of CEOs gave Rashida Tlaib, a newly elected Progressive from Michigan, a unique opportunity to “grill” Mary T. Barra, the CEO of Michigan-headquartered General Motors. While the absence of activists and the presence of CEOs at the orientation was immediately clear to progressives, what wasn’t as evident was that some speakers were also lobbyists, which Ocasio-Cortez tweeted about on the morning of the last day of the conference to the attention of national media. Ordinarily, the House Committee on Ethics places limitations on the presence of lobbyists at privately sponsored conferences. However, these restrictions do not apply to institutions of higher education, giving Harvard more freedom in inviting speakers. William D. Delahunt, former interim director of the IOP and former Massachusetts representative, was one target of criticism this year. Delahunt represents Fuels of America, a biofuels lobbying group, though the schedule listed only his Congressional background and IOP affiliation. He made remarks at the communal dinner on the first night of the orientation. Delahunt, who also serves as Vice Chair of the IOP’s Senior Advisory committee, says he and other lobbyists “were talking [more] about process than advocating for a particular issue.” If organizers of the program wanted to disclose the speakers’ lobbying ties in the future, he says he would not oppose it. 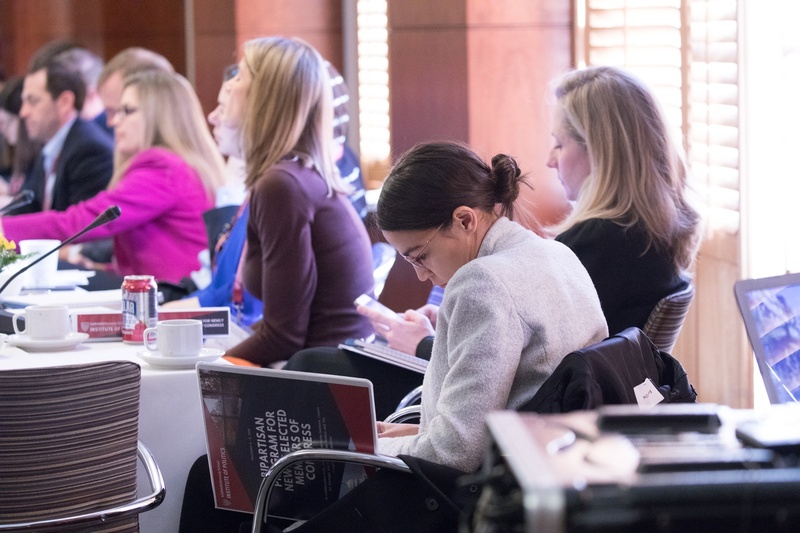 Alexandria Ocasio-Cortez (D-N.Y.) criticized the IOP’s failure to prominently disclose panelists’ lobbying ties, which were listed in full biographies in the orientation binder. Lofgren, the California Democrat elected in 1994 and a current member of the House Administration Committee, hopes to review the policies surrounding the presence of lobbyists at privately-sponsored conferences. Between the controversies surrounding corporate interests, hidden lobbying ties, and lack of grassroots activism and labor representation, the three-day-orientation reflected the changing ideological makeup of the Democratic party after the 2018 midterm elections. But based on the events of last December, not all members of the progressive left agree. Brady A. Roberts, a second-year student at the Kennedy School, criticized the orientation in an editorial in The Crimson. In an interview, he recalls with dissatisfaction that while the newly-elected members of Congress were congregating on the fifth floor of the Taubman building, the elevators used to access that floor were closed off to the public — a security measure and part of the IOP’s efforts to keep the conference intimate and press-free. To Roberts, it represented the larger ways in which students have been shut out of the events held in their classrooms. Hundreds of student-volunteers from the Kennedy School and College help facilitate each orientation, walking congresspeople between their hotel and the Kennedy School and attending breakfasts or dinners. Both students and members-elect alike report that the opportunity to engage with one another is a highlight of the program. However, Roberts wants students to have programmatic input. In his editorial, he proposed that students whose undocumented statuses are under threat would make compelling speakers on a panel about immigration. Like Ocasio-Cortez, he also wants labor activists to have a seat at the table. He said he wants the IOP to “entertain the notion that bipartisanship might include people who aren’t churning out peer-reviewed studies, aren’t leading publicly traded companies, but instead have their finger on the pulse for what people feel and believe in America,” he says. “Gary Cohn and the CEO of Boeing might have different political views, but they’re both coming from pretty monolithic expectations in terms of how change gets done,” he says. Kayyem, Kennedy School lecturer and orientation panelist, points out that for members of Congress, solutions are defined through very specific means: namely, legislation. The personal connections that the orientation facilitates can be as important as the policy lessons it provides. 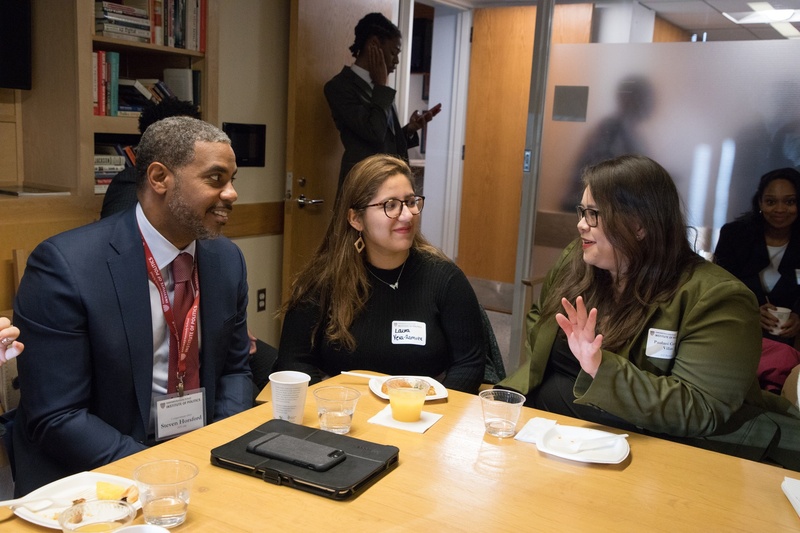 Steven A. Horsford (D-Nev.), who attended the 2018 orientation, notes he is now working on legislation focused on prescription affordability and the nation’s infrastructure with Congresspeople he met at Harvard during panel events on those topics. Steven A. Horsford (D-Nev.), who previously served in the House from 2013-2015, was unable to attend the 2012 orientation, but attended after his re-election last year. Above, he speaks to students over breakfast. Nonetheless, he agrees that the IOP can improve the orientation by addressing the criticism voiced this year. It seems willing to do so. Gearan notes that the IOP looks forward to collecting representatives’ feedback after they’ve held congressional office for a year or more. By then, he believes members will have more perspective on whether the orientation prepared them for life in Congress. From the beginning, the IOP considered Harvard’s unique selling point in hosting the orientation to be its faculty. Ushering in more outside perspectives, broadening the mission of the orientation beyond its academic, wonkish origins, has opened the IOP to criticism about which outsiders deserve voices. If CEOs were added to counterbalance academics, now, some want to counterbalance the CEOs. The orientation’s ambitious goal — to educate new members of Congress — might increasingly collide with partisanship. With each curricular correction spurring a counter-correction, the adjustments reverberate through the decades. —Magazine writer Clara J. Bates can be reached at clara.bates@thecrimson.com. Follow her on Twitter at @ClaraBatess. —Magazine writer Sonia F. Epstein can be reached at sonia.epstein@thecrimson.com. Follow her on Twitter at @Sonia_Epstein.